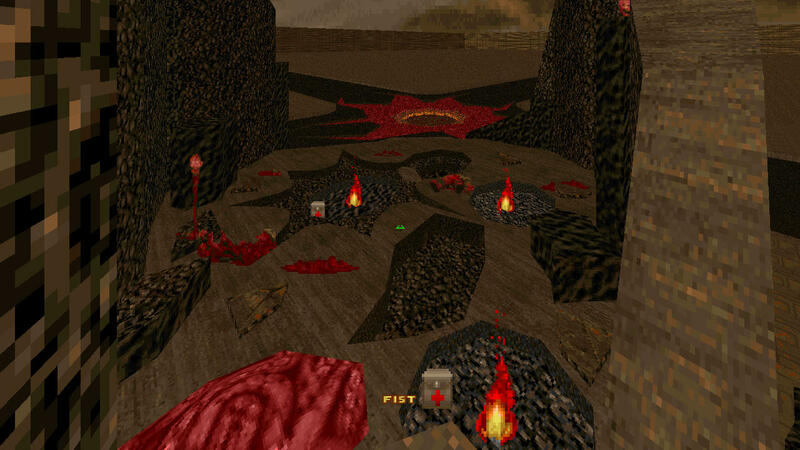 After Doom is modification of the eigth and final map of "Knee-Deep in the Dead". I always asked myself "what exacly happened after the portal guarded by the powerful barons in the map E1M8?". The phobos portal anomaly has to be fought from the roots of evil. Additional file : AfterDoom-lite; It is a light version, ideal to play using zandronum multiplayer. This version is also recommended for less powerful computers. See Credits lump for more detailed credit attributions. Last edited by 00_Zombie_00 on Fri Dec 07, 2018 9:49 pm, edited 20 times in total. Oh hey, this looks nice. Great skyboxes too. We might have a major new mapper on the scene. I really should have chose a better name. Wow. The graphics are absolutely amazing. I love this interpretation of hell, you should do more! Hell, you even managed to use colored lighting properly (I normally hate it because instead of creepiness it makes everything look like a disco concert). Only thing that lacks is the gameplay, it's pretty brutal and the difficulty progression isn't exactly smooth. I don't care though, I would probably enjoy just flying around with -nomonsters on, because the scenery is absolutely terrific. I absolutely loved it. It it reminded me so much of Doom64 and I'm partial to Doom64. My only complaint is that the automap gets very messy. I am looking forward to playing it when it's finished. Wow. That's a better Hell than the one presented in the demo of the new Doom game. And I must say it looks nice and moody even in software renderer of zdoom. - I like new Korax look-a-like boss, as it fits nicely hellish theme of this map and some of his attacks are truly devastating. So I was mildly disappointed when I found that final boss is plain cyberdemon. I think this map deserves more epic final ecounter and Korax would IMO fit in better. I recommend to somehow restrict movement of player when encountering Korax, as his attacks are mainly short to mid range, so player can snipe him off safely from distance. Maybe his arena could be bit recessed under level of ground and he would spawn only after player would cross center of that arena; to prohibit player of leaving it? - "Fallen angels" annoyed me a bit, because their fireballs are much faster than attacks of vanilla monsters. 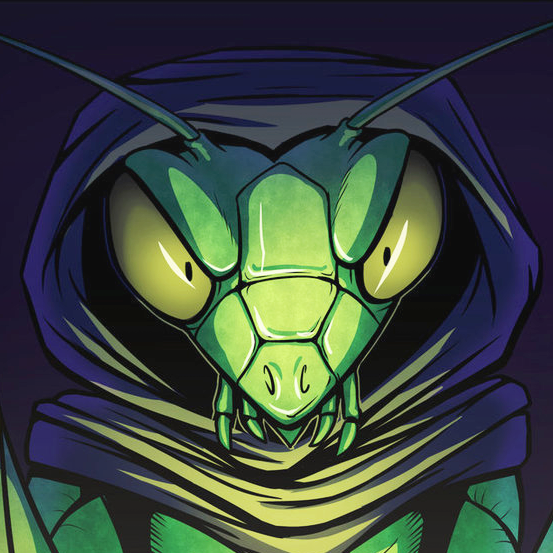 I know this is not your responsibilty, as you took them from Realm667 bestiary archive, but I cant imagine how quick their attack must be with fast monsters enabled. 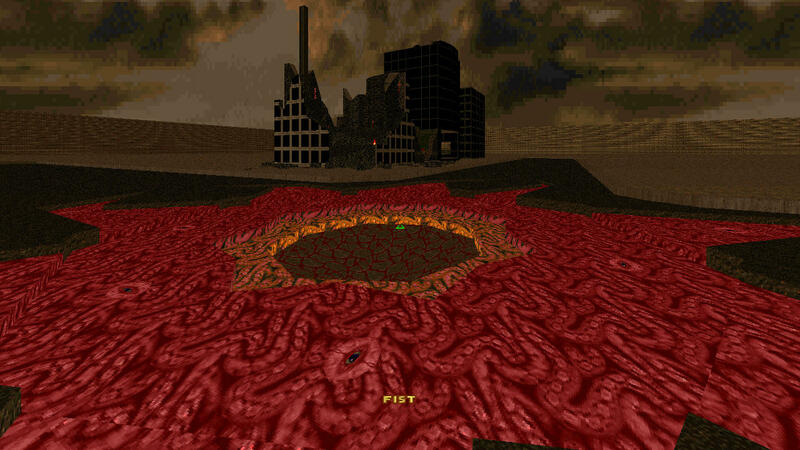 patrik wrote: And I must say it looks nice and moody even in software renderer of zdoom. im amazed of the amount of detail you were able to note. the hitler photo in the facebook page is just a joke that i made playing around with the skybox. due to that i also thought about making a secret boss fight out of it, but i have no experience with custom monsters, so it will be a while until i get to that. you are right, i could cage the player with korax to have a more interesting boss fight and also replaicing the final boss (the cyberdemon) with korax. its not the first time someone told me that the "fallen angels" were too hard, because of that, im reducing the speed of its projectiles, so that they are the same speed as an imp's fireball. thanks for taking your time to deeply test the map, your opinions are valuable and will help to make the wad a better experience with this small adjustments. "It stinks like rotten meat, but looks like the lost Demios Base. Looks like you're stuck in The Shores of Hell." , which allowed me to escape the final ambush before the map started up. Gentlemen, I have made many changes taking their views. I hope you have a better experience. This is an absolute expertly crafted map. I had a good solid 3 1/2 hour playthrough on this just because I was wanting to explore everything. Phenomenal work on this. Unnffff. This map is beautiful. I'd been craving some good Hell maps and this hits the spot. This wad... I would play again. And again. And again. DudeDesigns : It is a great honor for me that you've played so many hours, I hope you find all the secrets. I am very grateful to you. Boreas249 : thank you very much man. I'm sorry for the poor performance, it is a mistake because of my limited experience, I will try to fix it. I'm working on the second map of "After Doom". It's going to take a long time.